I know it has been a while. I am sure at some point all SL bloggers are like “Sorry everyone, RL!” I seem to say that a lot, but its true. RL is the reason I don’t always blog, which is why I retired from regular blogging so I wasn’t letting designers down. Instead I help Wicca manage her bloggers and do the other things I enjoy in SL with the time RL allows. 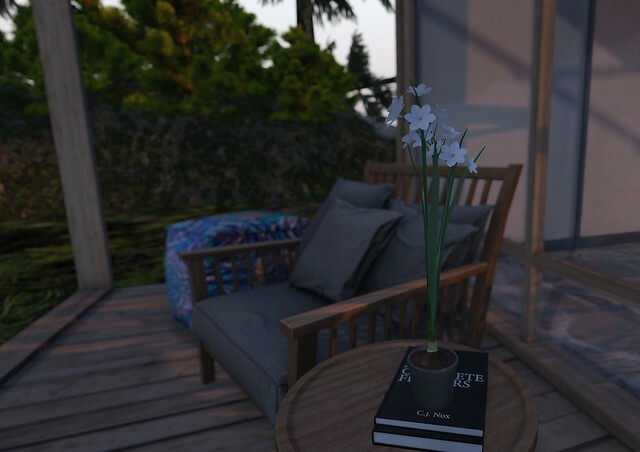 I find SL photography to be soothing and I have taken some photos recently that I haven’t placed here on my blog. I suppose I could insert them now in case you missed them, they were all inspired thanks to the latest round of VISIONAIRE. I love being reminded of what tools are available to us in SL to create something we find appealing. I cannot recommend VISIONAIRE enough. It is an incredible experience. Even as someone who has been through it a few times, you always come out with something new each time. What is cool is graduates are allowed to attend future rounds of VISIONAIRE courses at no extra cost and many graduates take advantage of that perk. I didn’t take a close up of the nails but they are by my favorite nail polish designer Giela Delpaso of Nailed It. The set I am wearing is the beach set and it is currently at On9. It also comes with a water set and they work with a lot of hands so chances are they work with your mesh hands!